Scientists, including 17 Nobel laureates, this week moved the minute hand of their terrible Doomsday Clock two minutes ahead, as they urged world leaders to defuse nuclear and climate-change threats to the world and humanity. We humans have, metaphorically, just three minutes to get our act together, they warn. 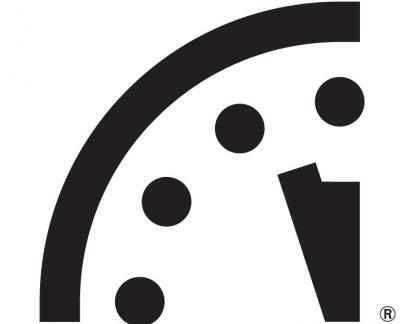 The decision on the Doomsday Clock is made annually, intended to signal the “world’s vulnerability to catastrophe from nuclear weapons, climate change, and new technologies emerging in other domains,” said the Bulletin. Eerily, the last time the people at The Bulletin of Atomic Scientists placed their famous clock at three minutes to midnight — essentially the global apocalypse — it was 1984. A climate catastrophe looms—but is not inevitable. According to US government environmental scientists, 2014 was the hottest year in 134 years of record keeping. Nine of the 10 warmest years on record have all occurred since 2000. This pattern is deeply disconcerting. In November 2014, the Intergovernmental Panel on Climate Change (IPCC) released its Synthesis Report encapsulating the key findings of its just-completed multivolume assessment of climate change. The IPCC reported that global warming is unequivocal and unprecedented and already responsible for widespread damage. It warned that warming—if unchecked by urgent and concerted global efforts to greatly reduce greenhouse gas emissions—would reach 3 to 8 degrees Celsius (about 5.5 to 14.5 degrees Fahrenheit) by the end of the century. Nuclear modernization programs threaten to create a new arms race. Although the United States and Russia have reduced their arsenal sizes from Cold War heights, the pace of reduction has slowed dramatically in recent years. According to Hans Kristensen of the Federation of American Scientists, “in terms of warhead numbers, the Obama administration so far has cut the least warheads from the stockpile” of any post-Cold War administration. The leadership failure on nuclear power. Nuclear energy provides slightly more than 10 percent of the world’s electricity-generating capacity, without emitting carbon dioxide. Depending on the type of fossil fuel displaced by the electricity nuclear power plants generate (that is, coal or natural gas), nuclear power plants help the world avoid approximately 0.5 gigatons of carbon emissions annually. But the international community has not developed coordinated plans to meet the challenges that nuclear power faces in terms of cost, safety, radioactive waste management, and proliferation risk. Dealing with emerging technological threats. The world’s institutions were proven arthritic during the recent outbreak of Ebola in West Africa. Medical scientists had a good grip on what to do to quell the outbreak of that deadly virus. But social and political institutions stuttered and, at times, failed to respond effectively. In the age of synthetic biology and globalization, world governance must develop ways to react quickly and effectively to confront emerging disease and the possibility of bioterrorism. Unfortunately, microbes are not the only emerging technological challenges to civil society and international governance. It is clear from the recent hacking of major organizations and government facilities that cyber attacks constitute a threat with the potential to destabilize governmental and financial institutions and to serve as a medium for new escalations of international tensions. Meanwhile, advances in artificial intelligence have led a number of prominent individuals to express concern about human command and control capabilities in the field, on national and international scales, over coming decades. Take actions that would cap greenhouse gas emissions at levels sufficient to keep average global temperature from rising more than 2 degrees Celsius above preindustrial levels. The 2-degree target is consistent with consensus views on climate science and is eminently achievable and economically viable—if national leaders show more interest in protecting their citizens than in serving the economic interests of the fossil fuel industry. Dramatically reduce proposed spending on nuclear weapons modernization programs. The United States and Russia have hatched plans to essentially rebuild their entire nuclear triads in coming decades, and other nuclear weapons countries are following suit. The projected costs of these “improvements” to nuclear arsenals are indefensible, and they undermine the global disarmament regime. Re-energize the disarmament process, with a focus on results. The United States and Russia, in particular, need to start negotiations on shrinking their strategic and tactical nuclear arsenals. The world can be more secure with much, much smaller nuclear arsenals than now exist—if political leaders are truly interested in protecting their citizens from harm. Deal now with the commercial nuclear waste problem. Reasonable people can disagree on whether an expansion of nuclear-powered electricity generation should be a major component of the effort to limit climate change. Regardless of the future course of the worldwide nuclear power industry, there will be a need for safe and secure interim and permanent nuclear waste storage facilities. Create institutions specifically assigned to explore and address potentially catastrophic misuses of new technologies. Scientific advance can provide society with great benefits, but the potential for misuse of potent new technologies is real, unless government, scientific, and business leaders take appropriate steps to explore and address possible devastating consequences of those technologies early in their development. Also on Facts and Opinions, read Anders Sandberg’s analysis in our Expert Witness section: Doomsday Clock: can we really predict the end of the world?